Call of Duty: Black Ops 4’s Blackout mode is an excellent battle royale experience, but since it launched, one annoying thing has become clear: Equipment is OP. Find the best equipment scattered around the map and you’ll be at a serious advantage even against players who can outshoot you. Matches are often won based off the equipment in a player’s inventory, or lost due to the lack thereof. There are a lot of great weapon choices in Blackout, but nothing clutches victory royales like certain grenades. This is due to the fact that tactical equipment is plentiful, has a large area of effect, and is hard to counter. A quick, easy toss of a grenade doesn’t even require any skill to be successful. The biggest equipment culprit in Blackout is definitely the concussion grenade. Black Ops 4’s concussion is way more powerful than the concussions of previous Call of Duty games. Instead of briefly disorienting you, one concussion grenade will completely blind you, stun you, and prevent you from aiming down sights or finding cover. As a victim of a concussion, you just stand there looking stupid, hoping that your opponent fails to kill you. You really can’t do anything to fight back, making the Black Ops 4 concussion more like a wildly overpowered combination of traditional Call of Duty stun grenades and flashbangs. The duration of the effect isn’t terribly long, but being that vulnerable for even a few seconds is enough to get you killed. If it’s not concussions, it’s clusters. Once thrown, the cluster will stick to whatever surface or player it hits, and then detonates into a chaos of smaller grenade explosions. It’s way more powerful than Black Ops 4’s standard frag. The options for countering an end-game monsoon of clusters and concussions are severely limited. You can use a piece of deployable equipment called a “trophy system” to destroy enemy equipment tossed your way, thus making this the most logical choice to avoid getting pelted with ‘nades. Unfortunately, trophy systems often feel like pretty rare finds. The Reinforced perk is an alternative countermeasure, which offers extra resistance to concussions and reduces damage from explosions and fire. But perks in Blackout work differently than traditional multiplayer perks. 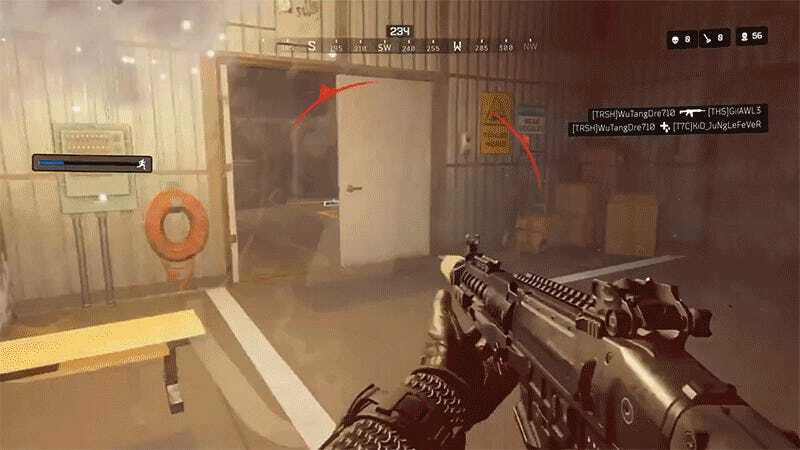 In Blackout, they’re consumable items that only offer assistance for a very limited timeframe. Once activated, Reinforced will only protect you two times within the duration of 240 seconds. The perk can obviously be very handy, but I rarely have Reinforced in my inventory by the time I reach the final circle, and that’s when countermeasures matter most. 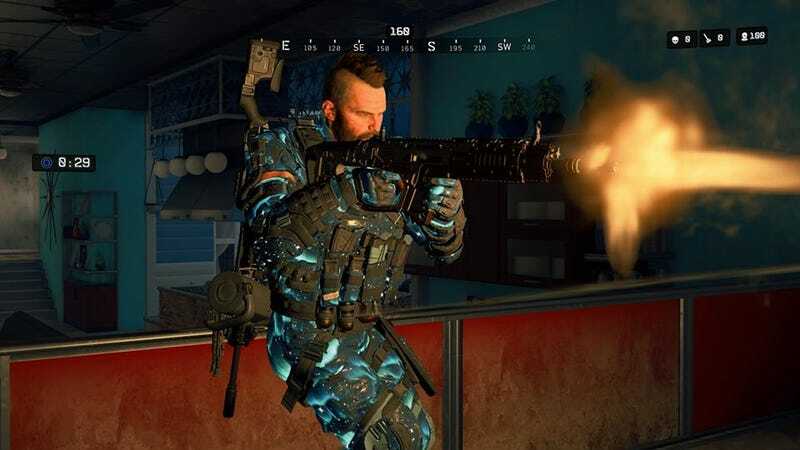 Minor changes have been made to Blackout’s equipment since launch. Ajax’s 9-Bang concussion was completely removed from Blackout for being even more overpowered than the regular concussions. And Treyarch reduced how many concussions and cluster grenades could be stacked in an inventory slot. Unfortunately, the grenades spawn so frequently that you still won’t have a problem filling up your backpack slots with equipment. In an average match of Blackout, I’ll come across tons of clusters and concussions, but I might not see a trophy system at all. The Reinforced perk is a little more plentiful than trophy systems, but I still rarely consume the perk at the right time. I’m more likely to get pelted with a grenade before I have a chance to activate the Reinforced perk, or after the effects of the perk have ended. I’m sure that’s the same case for many Blackout players. None of these countermeasures seem to stack up against the abundance of powerful grenade types found on the map. So I can completely understand why many players are calling for the concussions to be removed from Blackout. I’ve never been so dominated by equipment in any other battle royale game. I don’t often lose Fortnite matches because someone tossed a Boogie Bomb at me, forcing me to dance around and not be able to shoot. However, it’s very likely I’ll get hit with concussions in Blackout, and i’ll be forced to stand with my hand in front of my face like a complete idiot. Imagine being the last left alive in your four-person squad. Your dead squadmates are spectating you all the way to endgame, and all the pressure is on you. The Nova Gas circle is closing in fast, and you’re scanning the trees ahead for the last remaining enemies. Out of nowhere, a concussion lands at your feet. The screen instantly flashes white, your hand vulnerably goes in the air, and BAM! You’re dead. It’s disheartening, and a pretty common scenario in Blackout. Unfortunately for the no-concussions crowd, Treyarch’s Design Director David Vonderhaar commented on a Reddit post about concussions to say that the developer has “no plans to remove them from the game.” Instead, Treyarch said that it would fine-tune some equipment in tomorrow’s January 29 update. Concussions will have a reduced area-of-effect radius and throw distance. Clusters will have an increased time to detonate, allowing players a better chance to flee the blast radius. There will also be a damage reduction for the explosion of mini-clusters. While these changes should make some slight improvements, it’s unlikely that this will make the equipment less appealing to players. The final moments of the game could still easily come down to a barrage of concussions and clusters for the victory. Maybe I’ll dodge the first cluster thrown my way, but I might not be so lucky if there’s a second or third one. There needs to be better balance between the equipment and countermeasures. It could help to reduce the spawn rates of the grenades, because equipment so powerful shouldn’t feel so abundant. Every building doesn’t need a trophy system, but they could spawn a little more frequently. And if Ajax’s 9-Bang is deemed too powerful of a concussion grenade and gets removed, I’m not sure why the clusters, which are the special weapon of the Battery specialist in standard multiplayer, still remain. I have faith Treyarch will keep tweaking the system until the quality improves, but until then you’ll find me hopelessly searching for trophy systems.